This is an optical device consisting of a rigid or flexible tube with an eyepiece on one end and objective lens on the other linked together by a relay optical system in between. In some cases, the optical system is surrounded by optical fibers used for illumination of the remote object. 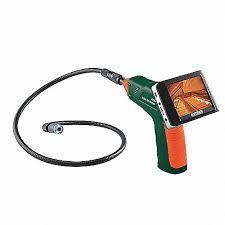 Borescopes can be used for visual inspection work where the area to be inspected is inaccessible by other means. Borescopes are commonly used in the visual inspection of aircraft engines, aero derivative industrial gas turbines, steam turbines, diesel engines and automotive and truck engines. Gas and steam turbines require particular attention because of safety and maintenance requirements. Borescope inspection of engines can be used to prevent unnecessary maintenance, which can become extremely costly for large turbines. They are also used in manufacturing of machined or cast parts to inspect critical interior surfaces for burrs, surface finish or complete through-holes. Other common uses include forensic applications in law enforcement and building inspection, and in gun-smithing for inspecting the interior bore of a firearm.